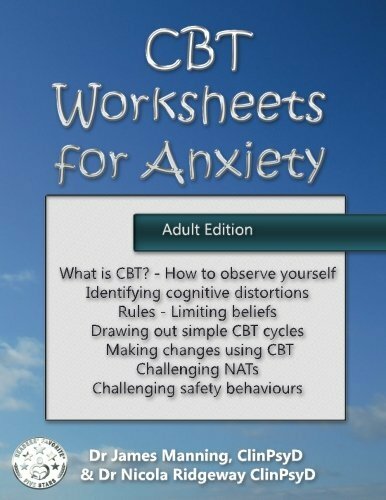 Article first published as Book Review: ‘CBT Worksheets for Anxiety’ by Dr. James Manning & Dr. Nicola Ridgeway on Blogcritics. “CBT Worksheets for Anxiety” by Drs. James Manning and Nicola Ridgeway is an incredible resource for anyone who has difficulty dealing with life stressors, psychological concerns, or anxiety in their daily lives. Dr. Manning captures the attention of the reader right from the beginning as he describes some of the experiences that caused negativity in his life at a younger age. Readers often feel more comfortable when authors can relate to what they are going through. Dr. Manning gives a very clear definition of what CBT (Cognitive Behavioral Therapy) is and includes several links to find more detailed information about CBT and how it can help individuals. As a former therapist, I have often used CBT with clients, which focus on the here and now and is a brief therapy. The goal of CBT is to help one change the way they think, behave, and react to their feelings. Worksheets, diagrams, and pictures help one fully visualize how CBT works and how faulty thinking puts us in a negative situation. An excellent example of this is on page 14, showing how anxiety causes one to worry more, although the authors do state that not all thoughts cause anxiety. One aspect of CBT stated by the authors is to stand back and reflect on our thinking process, which is often easier said than done. This reviewer believes the diagrams in the worksheets are most beneficial, as seen on page 30 with the ‘Thought, Physiology, Emotion, and Behavior’ sheet. This gives one a true observation of what happens when something triggers us to think irrationally. On page 33, Table 3- ‘Thinking Biases’ gives one the opportunity to determine what type of faulty thinking one might engage in and gives the signs to look out for. Chapter 4 – Rules, was one of the best chapters for this reviewer. It describes and gives examples of rules we follow to live our life safely (or so we think) and protect us psychologically. A good example that I can relate to is “If nobody is upset with me and everybody likes me all the time I will be OK.” The problem with this is we tend to put others before ourselves, which causes anxiety and stress. The authors have developed this workbook to be easy to read and understand, as well as to challenge one to make positive changes. They do state that CBT is not easy, as often we are our own worst enemy. Even though one can do CBT on their own, it is best to do this with a qualified therapist. This means someone trained and experienced in the field of CBT. "CBT Worksheets for Anxiety" by Dr. James Manning and Dr. Nicola Ridgeway is a must read for all who are dealing with anxiety or other issues that impact their lives on a daily basis.